In this interview, Dr Simon Kold explains how he and his wife and co-surgeon Dr. Louise Kold implemented a digital workflow in their practice and talks about the lessons they learned from it. Alongside his position as an international lecturer, Dr. Simon Kold has been running the Herning Implant Center in Denmark with his wife, Dr. Louise Kold, since 2014. In this interview he talks about their journey to a digital workflow, how they integrate their staff into these workflows, and what he expect the future of digital dentistry to look like. Nobel Biocare: Dr. Kold, could you please tell us a little bit about yourself and the main steps in your journey to a digital workflow. Dr. Kold: “In 2002, I began working at the Herning Implant Center, which was founded by my parents back in the 1970s. In 2005, we began working with Nobel Biocare’s Teeth-In-An-Hour concept, which was our first possibility to perform CAD/CAM guided surgery. We found out that Nobel Biocare’s prosthetic-driven implant placement offered a lot of benefits – not only could we position implants well, but we could often make surgery easier for both dentist and patient. Over the past few years, we have learned that we can place implants more precisely if the procedure is guided. That’s why we began intraoral scanning in 2011 to be able to combine surface scanning with CBCT imaging to make guide stents. Of course, correct implant placement is essential for long-term stability, which, in turn, reduces the likelihood of implant failure. Combining X-Guide and DTX Studio™ suite enables us to do virtual planning , and then export the plan to X-Guide, so the system is bypassing the need for guide stents and models. For example, we can plan implants for partially edentulous patients, export the planning to X-Guide and at the same time prefabricate provisional teeth – everything is model free. In a way it is like working “free-hand” when placing implants. There are close to no limits in patient selection. We have been able to treat simple flapless cases, patients with limited mouth openings, patients with the need for soft and hard tissue augmentation, and patients where flapless surgery is the best option. Drs. Simon and Louise Kold and have been working with the X-Guide system for almost a year. Looking back at your journey, what recommendations would you give someone who wants to invest more in digital technology and workflows? You would never be able to do something freehand with as much precision as you can when it’s guided, so using a digital workflow has made it easier for us to deliver predictable prosthetic work. What do you see as the benefits and the challenges of a digital workflow, and how has your staff reacted and adapted to this approach? Dr. Kold: “One of the biggest challenges was spending a lot more time in virtual planning. However, we wanted to spend the same amount of time in the clinic as we did prior to the digital workflow integration. Louise and I decided to divide the workflow into two areas, things that only we could do, such as virtual planning and the actual surgeries, while leaving the rest to our assistants. In practice, this means that if a patient spends two hours at our clinic for a standard implant treatment, Louise and I will only see the patient for15 to 20 minutes. The rest of our time is spent concentrating on virtual planning while our team focuses on patient care. For example, one assistant is communicating with the patient, while another is handling the scans, and yet another is producing the guides. This way, the patient always feels as though we have time for them and Louise and I can spend much more time in the treatment planning phase. In addition, our staff have responded very positively because they are a lot more involved in scanning and producing guides than before. This responsibility makes work not just more fun but is more productive as well. Since August, you have been working with the new X-Guide system which now shares a connection with DTX Studio™ suite. What are your experiences with that system so far? Dr. Kold: “The possibility of combining X-Guide with the DTX Studio™ suite has only just become a reality for us. X-Guide is a tremendous system that allows us to take on complex cases and create advanced treatments through a new type of digital workflow. 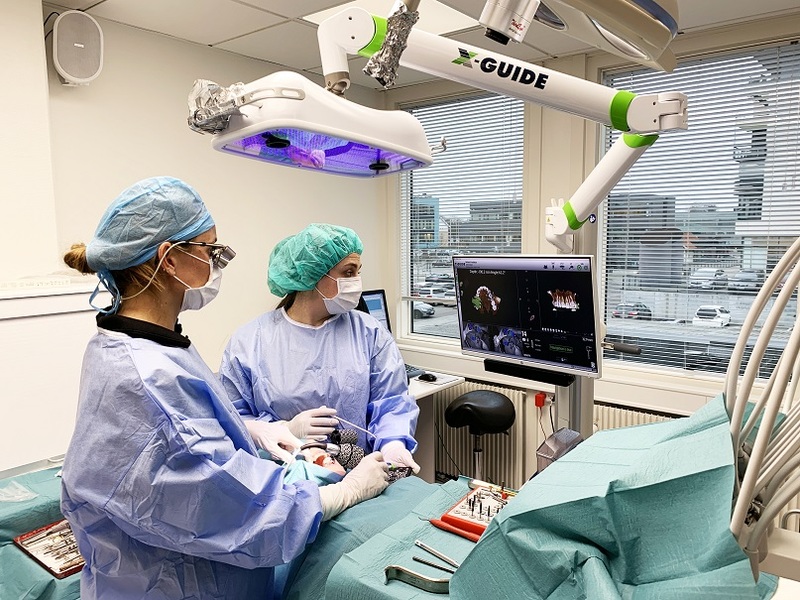 It is an amazing tool that provides real-time feedback during surgery, so the surgeon can pinpoint anatomic landmarks as the mandibular inferior nerve or the sinus floor location, even when performing flapless surgery. Where do you see digital dentistry heading in the next few years? What other benefits of digital dentistry do you see, especially for the patient?